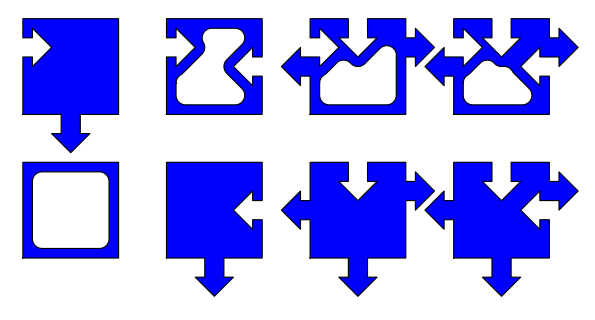 Previously I wrote about implementing 1D cellular automata as tile puzzles. 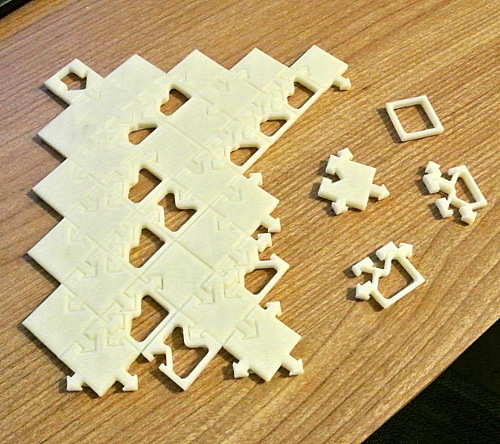 My previous solution needed four linker tiles. I've now found a way to get rid of these. Each tile simply transmits the state of the tile above it to its left and right neighbours. Filled tiles are "on" and empty tiles are "off". 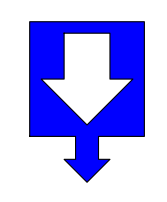 Downward arrow on the base transmits the state to the cell below. Outward sideways arrows transmit state of N neighbour to E and W neighbours. Inward pointing arrows receive state of NW neighbour via W neighbour, state of N neighbour, and state of NE neighbour via E neighbour. Starting from this seed in the middle of a line of empty squares, the puzzle has a single, infinite solution. The column of tiles below the seed passes tests of randomness used to test pseudo-random number generators. Rule 30 is used as a random number generator in Mathematica. Rule 30 is a simple demonstration of Stephen Wolfram's observation that mathematics is random, and that "creating information" is trivial. I previously speculated about making these tiles from plastic. Technology to do this is now readily available. You might also like to try other elementary cellular automata, such as Rule 110 which is a computer.